The Parnham Family have been involved with horse racing for more than 50 years. Neville’s Father Harold and Uncle, Eric Parnham, were prominent Ascot based trainers for many years. After leaving school Neville became an apprentice jockey indentured to his Father. Weight restricted his career in the saddle, but not before he booted home more than 40 winners around the State. Neville took out a trainers licence in 1983 and has not looked back since. He learned his trade by taking teams North to Broome for the annual round. These early trips saw him responsible for all tasks associated with handling a team of horses on the road, including driving the float, riding track work, doing the farrier work and placing horses to win races. This experience coupled with the knowledge he learned of handling horses from his Father and Uncle, set him up to become the leading trainer he is today. His first ever winner was Artist of Note on 16 June 1983. Since then the winner’s kept coming and along the way Neville has honed his skills as a conditioner of horses. 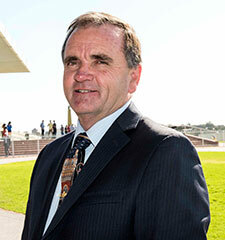 His first trainers’ premiership was won in 1992. His second premiership came in 1999 which started a winning streak of the next 11 premierships in a row – a record 13 premierships to date.